Please forgive the indulgence. 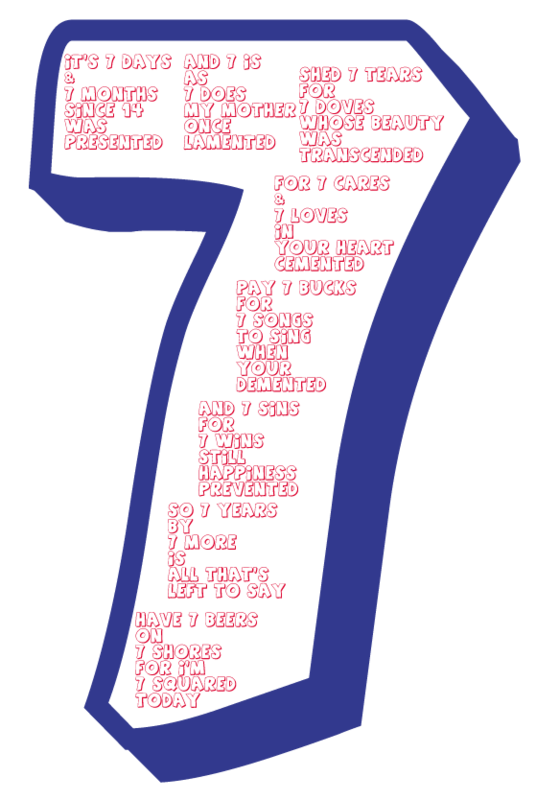 Today – the 7th of the 7th – is my birthday you see and I turned 49 – I thought turning 7 squared on the 7th of the 7th was pretty special so I wrote this poem to celebrate that fact. Excellent poem happy birthday! 7 is my favorite number and today is your lucky day! It sure is! Thanks so much. Brilliant! What a great birthday song. (It feels like a song, even without the music!) Some truly touching lines in it, too. “Shed 7 tears for 7 doves whose beauty was transcended…” Well, you have another year to think what 50 years of age will bring up for you! I’m sure it will be a great year for you. Thanks Lesley, yes I sing it like a ditty in my head. It was my birthday song! Reading this post was funny for me. My mother recently turned 49 and would like reading this sort of thing.